Thanks largely in part to the recent growth of small community-centric music festivals such as SappyFest, Shivering Songs, Obey, and In the Dead of Winter, the Maritimes — and New Brunswick in particular — have had the opportunity to experience a wealth of talented, understated, lo-fi and stripped-down musicians for which the bay-residing show-going public seems to have a growing affinity. In recent memory, this has seen such figures as Mark Kozelek, Calvin Johnson, Dan Bejar, and Liz Harris upon the venue's pulpits and small stages with minimal speakers (if any at all). Beautiful old churches and theatres are often the chosen venues for these shows and truly showcase the acoustic fervour for which they were designed. In this case, on a cold, snowing January night, a hushed and bundled up crowd had gathered in the 164-year-old gothic-style Wilmot United Church. 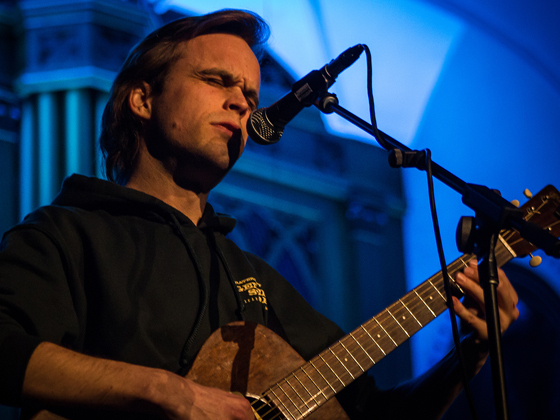 While many were excitedly awaiting show headliner Owen Pallett, everyone was in for quite a treat from Portland, OR's Peter Broderick. Despite spending the majority of his life in Oregon and Europe and never having been to Fredericton, Broderick's performance had the energy and familiarity of a homecoming. The festival organizers flew him out a few days early to travel to his birthplace of Searsmont, Maine, which he had not been to since the age of three more than two decades prior. Sporting hometown clothes, photos, and journal entries, Broderick was ready to bare his soul. An artist known in equal parts for his ambient and neoclassical compositions as for his singer-songwriter folk output, this live show featured him running and hopping with energy to spare from instrument and stage to cover the whole gamut including piano compositions, a cappella driving ditties, and a violin duet with Pallett. The spectacle left the audience saying: "Come back home soon, Peter!"